Drop forging is a metal forming process that a billet is inserted into a die and then hammered until it has assumed the shape of the die. The lower die is a stationary part,while the upper part is a moving hammer dropped onto the workpiece in order to deform it. Drop forging can be operated both at high or room temperature. This manufacturing process has a long history in the metal shaping industry and it has been applied for hundreds of years. The mechanics of the process are still the same, but all involved machinery has greatly advanced to turn drop forging into a high-precision manufacturing process. Similar to all other forging techniques,drop forging enhances the material properties of products. In side of the position of the dies,drop forging can be divided into two types: open die forging and closed die forging (see the difference between open die forging & closed die forging). Like the name,an open die doesn’t completely cover the billet and deformed into open space. The metal stock is placed by an operator on the die, and then use a hammer continuously striking it. Before each strike the operator will change the position of the workpiece until achieving expected shapes. Open-die drop forging is a common manufacturing process for larger steel components, providing some important benefits as greater strength,improved grain size and continuous grain flow. A closed die looks like a mold, attached to the anvil, in which the metal is inserted.The hammer die is also shaped and when striking the workpiece the material flows and fills the die cavities. The hammer is dropped fast in very quick successions until the desired shape is obtained. Sometimes the shape requires the use of series of different cavities. Although the initial investment in closed-die equipment can be quite high because of the specific design of the dies cavities, it is more economical when closed die forging is used for large volume metal parys. Therefore closed-die drop forging is often used in the automotive and tooling industries. Forging is a processing method that involves the manipulation and shaping of different metals. Compression is used in a number of different ways to shape the metal and can be carried out in cold,warm and hot conditions. Press forging is a method of forging that involves the slow and continuous pressure on the workpiece. This method differs greatly from the heavy and quick blows used in drop and hammer forging. The contact of the workpiece in the die is measured in seconds whereas drop forging and hammer forging is measured in milliseconds. Press forging can be carried out either hot or cold. There are many advantages of press forges but the biggest is its ability to deform the workpiece. Hammer forging can only affect the surface of the workpiece whereas press forging can change the shape and interior of the workpiece at the same time. 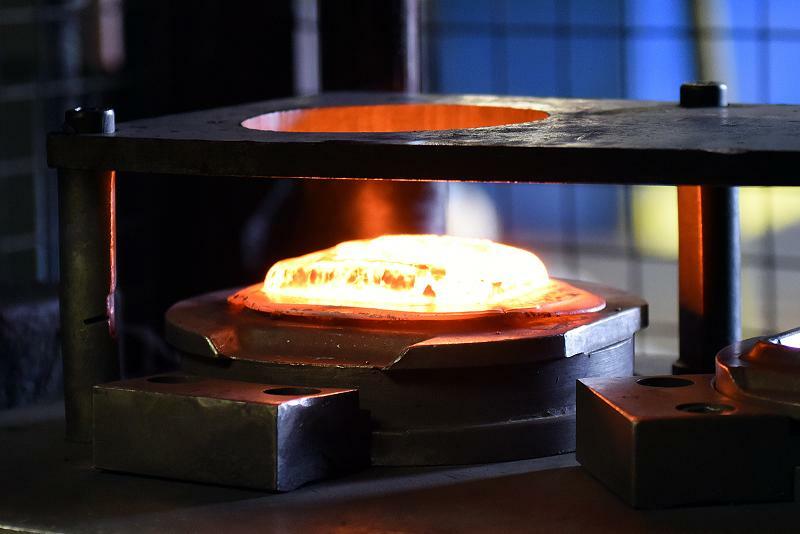 Press forging is a little more controlled than hammer forging and gives us a better knowledge of a part’s strain rate - that is how much pressure will cause manipulation of the part. Another advantage of press forging is that it is more efficient. 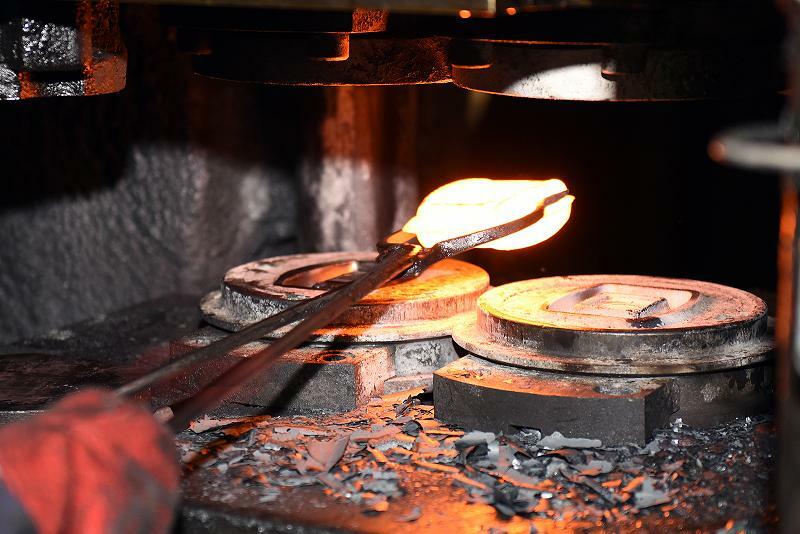 During hammer forging,the hammer absorbs a lot of the energy that could otherwise be focused on the workpiece. Press forging allows great efficiency and more control over the forging of the piece. Press forging can also be used to perform a number of different kinds of forging including impression-die press forging and open-die forging. Drop forging is when half of the die is dropped from a height onto the other half of the die, which will contain the hot metal workpiece to be formed. Drop forging is more suitable for mass production. Press forming is instead of dropping half the die onto the other half the two halves are put together and pushed together under a large pressure (up to about 10000 tons) forming the object. The difference is that drop forming leaves the centre of the metal not so hard as the outside, but press forming gives more uniform hardness for larger components. Of course, drop forging and press forging are defined in term of two kinds of forging methods. We could also differ forgings from its temperature, such forgings are named into cold forging, warm forging and hot forging. (See cold forging vs warm forging vs hot forging). Cn it be said that drop forming uses the concept of impact loading? Do closed press dies last longer than hammer dies for the same amount of parts run? Say for a connecting rod die two cavity. Which choice is more economical for set up time when switching out jobs? It is really helpful for me!